Any new parent knows how important it is to ensure their precious bundle is safe and sound at all times. First time parents, especially, are very aware of the safety of their baby when they are not in the same room at any given time. Baby monitors are vital in ensuring both peace of mind for parents, as well as ensuring that the baby is monitored and safe, and is an effective device should anything go wrong or if an emergency arises. The V-Tech company started up in 1986 in Hong Kong as “Video Technology Limited “and was originally a manufacturer of video game consoles. Since then, it has moved in leaps and bound, changing its name to “V-Tech Holdings Ltd” in 1995, when it began to manufacture and sell the first fully digital cordless phone. V-Tech is now rated as one of the top 50 electronic manufacturing suppliers, with their baby monitors being one of those products. The VTech Communications Safe & Sound Digital Audio Monitor has a clip in the belt so that you can wear it all around the house. This means that your baby is constantly monitored whilst giving you the freedom to go about your daily tasks without constantly running in to check on the baby. 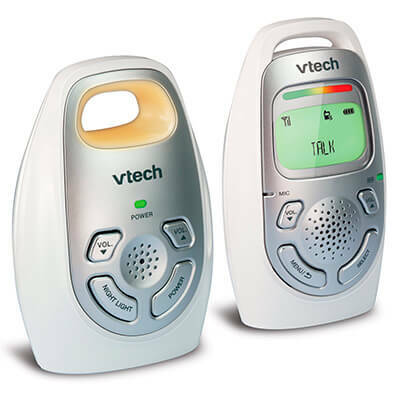 Thanks to V-Tech’s DECT 60 digital technology, the monitor provides crystal clear sound and eliminates white noise so that the only sounds you will hear will be those coming from your baby. It has a 5 level sound indicator, which displays the sound level in the room that your baby is in. The has a range of 1000 ft., which means you can hear your baby from any part of the house, adding more to your peace of mind while you do what you need to do. Remotely communicate to your baby from the parent unit to the baby unit; Not only will you be able to hear your baby, your baby will be able to hear you so it doubles as an intercom. When there is sound in the baby’s room, you will be silently alerted, so you can enjoy some added peace by. You can turn the volume down so that you are able to rest without hearing unnecessary sounds, such as baby stirring or moving around, but by the monitor’s vibration feature or the sound alert. If you can’t locate your parent unit, simply push the page button on the baby unit, which causes the parent unit to continually beep until the parent unit is found. The nightlight function can be set as a constant nightlight or to only light u when baby’s sounds are detected. The light is dim enough so that it does not wake baby, but also light enough to comfort baby should he or she wake up. 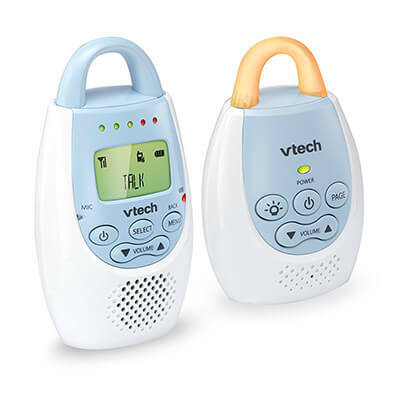 This VTech Baby Monitor has had mixed reviews ranging from extremely positive to very negative. As with all baby monitors it has both pros and cons. 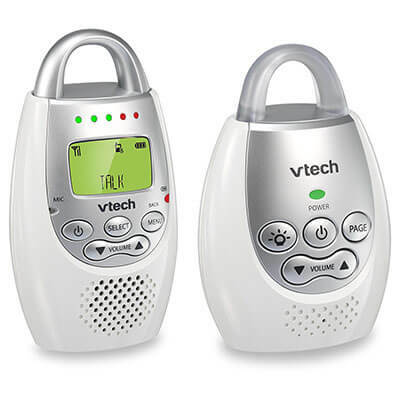 The VTech Safe and Sound Digital Audio Monitor definitely has some issues when it comes to battery and volume control, according to reviews, but it has many great features akin to those monitors that sell for much higher prices. All in all, it is fantastic in detecting even the slightest of sounds, which is the main priority one looks for in a good baby monitor and good value for money.